Q: “Do you have class gift certificates for classes”? A: Yes, simply click on the link below under “You may also like” and buy the certificate. Certificates are not downloadable but we send them out the same day to either you or the recipient. The student would then go to this site, select the date they would like to take the class and add to the shopping cart. At checkout, the user will enter their certificate code (located on the back of their card). There is no charge to the recipient using this unique code and the student will be signed up for the date they desire. Complete redemption instructions are sent with your special gift. Q: “Can I miss a class and retake it later”? A: Our classes are taught in 2 parts. Students must take part 1 first but can reschedule part 2 anytime, providing there is room in that class. Couples will need to take both classes together. Q: “Can I get a refund if I change my mind”? A: No but you can get full cash value toward the purchase any of our trees or supplies. 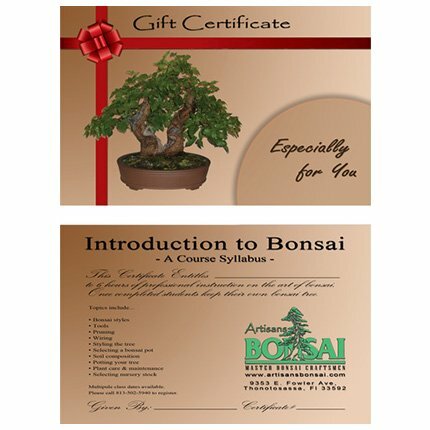 YOU MUST notify Artisans Bonsai 72 hours before the class date. Q: “Do I need to bring anything to class”? A: Just your complete attention and a desire to learn. Class 1 will be in the classroom. Class 2 is a hands on class in the nursery. Be prepared to get a little dirty. Q: “Can I bring my own plant”? A: For the purposes of this class we will provide the plant to be used. You can practice what you have learned on your own plant when you get home.